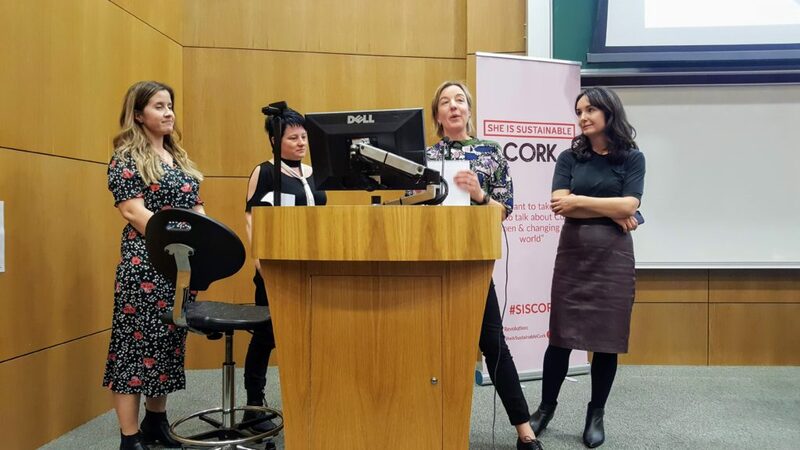 When Madeleine of Change by Degrees / Plastic Free Kinsale asked me to speak on the Social panel at the first She is Sustainable Cork event, I said yes – but honestly didn’t know what I was going to talk about. 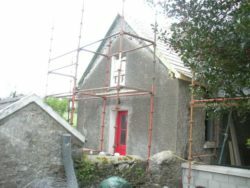 I try to live in a sustainable way but can very easily number the ways that I fall short: we live in a renovated cottage – but, as it is in the countryside, have to drive everywhere. Most of our furniture is second hand – but I have two girls who love plastic toys (new and old!). I wear mainly pre-loved, charity shop clothes – but travelling to NZ to spend time with family is non-negotiable. Because I love to cook, food waste is never a problem – but even raw materials can often come in single use plastic. This is my own sustainability story, a story about building my own local sustainable food economy. 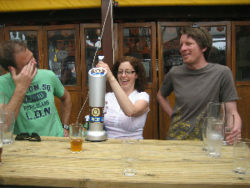 In 2011, a Kiwi and an Aussie brewed their first beer in Mitchelstown and launched Eight Degrees Brewing. The Kiwi is my partner, the Aussie a good friend. At the time, we were living in a one-bedroom, nineteenth-century cottage. I was pregnant, we were sharing our room with a two-year-old toddler, while the Aussie slept on the floor downstairs. The boys worked on building our brewery business while I worked as a freelance journalist – focusing primarily on food – and project managed a shoe-string cottage renovation. Looking back, it was an insane time to set up a business. With Ireland amidst the worst recession in modern Irish history, what were the chances that people would want to spend more on a pint of craft beer? But they did. And gladly. Because they could see that spending money locally made a local impact. As we got busier, the two lads were joined by crew of 10 people, including me part-time. That’s ten people that go into Mitchelstown’s Market Place restaurant for lunch, that head down town to the Favourite when we need stationery – that even buy Santy’s bike deliveries from a local publican, who also happens to have a bike shop. But this is not about Eight Degrees. This is about small producers, about sustaining and supporting a network of local food businesses as a consumer. There are stats that I knew as a journalist – every €10 spent locally generates €24 of benefit to the local community [Source: ISME stats from 2015. The updated 2018 stats: “Every €10 spent locally on Irish products generates more than €40 of benefit to the local community in terms of employment.” ]. It wasn’t until I became involved in a small business that this figure truly made sense. Because I was so grateful to all those people who were supporting and believing in us, one beer at a time, I paid it forward as a consumer. When we were broke – and we were very, very broke back in those tough start-up days – every time I was paid for a freelance job, I took some of that money and went off to the farmers’ market in Killavullen or Limerick or Mahon or Midleton to support other producers who I knew were also going through a tough time. I paid that money forward, because I wanted us all to come out the other side of the recession. And because I wanted my family to eat good food. 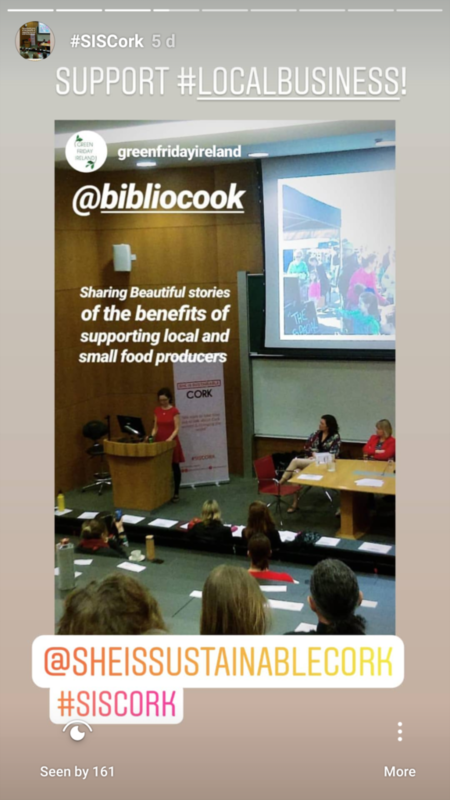 I was also able to support other small producers through my work, through writing about and broadcasting their stories at a time when it seemed Ireland was just waking up to the wealth of food on its doorstep. Shopping for food is a political action and it’s also an action that can support your own local sustainable economy. Every choice matters – and every choice can make a difference. Of course I shopped in supermarkets as well, but I also wanted my kids to know where their food came from. My toddler, who spent many, many mornings at farmers’ markets, used to ask for Gudrun’s cheese or Fingal’s salami or Declan’s bread, making a beeline to her favourite stalls at any market. She knew the hands that made her food. She’s ten now and she still meets and knows many of those market stall holders, who are all still around and who have seen her and her sister grow and be nourished by the food that they produce. Occasionally, if they’re very lucky, they even get to work behind the stall at a farmers’ market! As a producer, consumer and journalist – in 2014, I co-wrote a book called Slainte: A Complete Guide to Irish Beer and Cider to tell people what was available on their doorstep – brewing is the area that I have come to know most about. It’s just one of the home-grown sustainable industries that sprang to life during the recession, using predominantly Irish-sourced ingredients. Micro brewing is 18 times more labour intensive than macro brewing – those 522 people would be reduced to just 29 employees in a macrobrewery. This is something that also holds true for other food producers. It takes a lot more people to make a real farmhouse cheese like Gubbeen than it does to produce a blend of cheese, vegetable oil and whey powder, otherwise known as Easi Singles. I know which I one tastes better too. 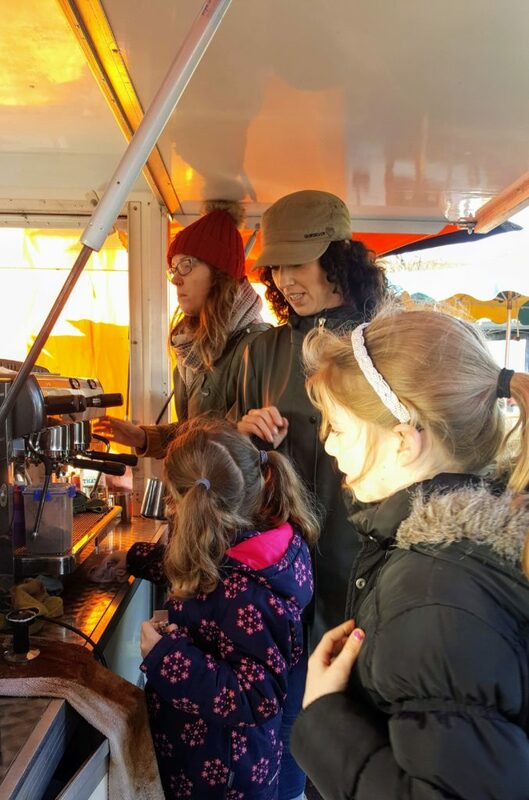 Although I love the fact that, for me, local food is all about markets, about tasting and talking and finding out the stories – and coming home with my arms having had a workout from dragging shopping baskets around – there are also other ways of finding local food and supporting local producers. Check out the English Market, go in search of your local veg box delivery service – I hear good things about Organic Republic– check out the Neighbour Food markets website that was set up by Jack Crotty of Rocketman here in Cork, support the shops, restaurants and cafes who buy local. 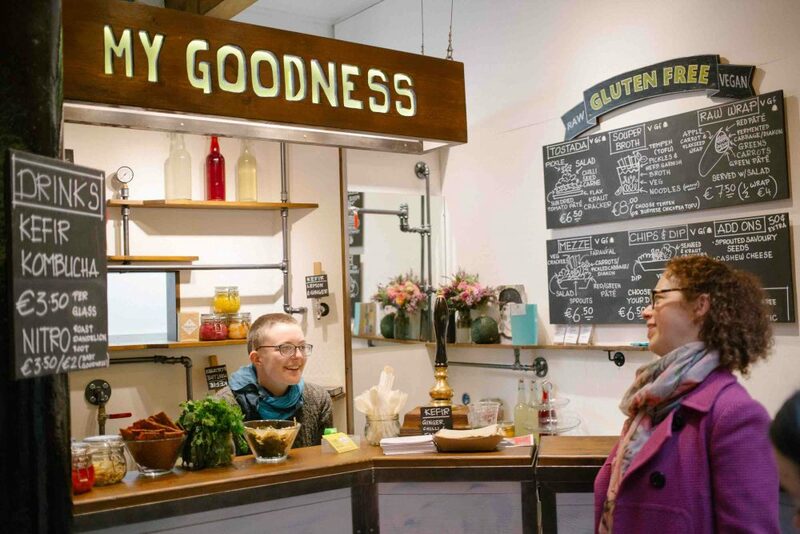 By focusing on local, by supporting local markets, local farmers and local producers, by championing them, you can build your own sustainable food network one tasty bite at a time. It’s worth it, just to discover how very delicious sustainable can be. The ladies in this picture are the foursome that pulled the conference together: Sinéad Crowley of Cool Planet Experience / @AGrassrootsAdventure, Rosemarie MacSweeney from the International Energy Research Centre at Tyndall National Institute, environmental scientist Dr Tara Shine and archaeologist turned entrepreneur and media strategist Madeleine Murray of Change By Degrees. Put your own oxygen mask on first – walk, run, swim and reconnect with nature, other people and yourself. Make a living, not a killing. We need policy from the top down – and the bottom up. Always be humble enough to listen to somebody else. None of us do enough, but we can all do something and millions of people doing small things can make a real difference – but make sure you follow them up with political action. Photo credits: top SISCork pic by Green Friday Ireland, pic of us at our first ever beer festival by Catherine Brodigan, pic of me at the English Market by Dan Dennison for The Gannet.